Hello there, my name is Paul and I’m a Solutions Architect at CloudFactory. What does that mean exactly? I'm responsible for understanding our clients' data capture needs and determining how to best leverage the power of our platform and our people to achieve desired accuracy, speed, and scale. More simply, I’m often waist-deep in workflow diagrams. And I love it. As a Solutions Architect, I appreciate well-designed processes in nearly any context. A non-profit equipping students in need with computers to help them achieve their potential is certainly no exception. Everyone at CloudFactory is challenged to connect with one’s community and carry out team-based service projects every six weeks, regardless of where we are on the globe. 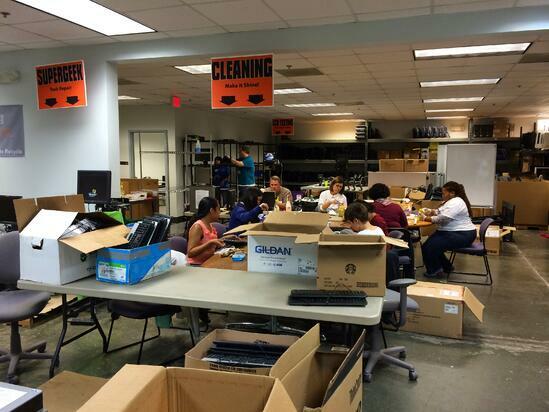 Here in our recently opened US office (Raleigh-Durham, NC), ideas were solicited for a service project local to us. I was quick to suggest volunteering at Kramden Institute, an organization I’ve worked with before and which lies at the intersection of three things I personally care a great deal about: kids, education, and technology. Kramden is a non-profit dedicated to “empowering hardworking, yet economically disadvantaged, students to cross the digital divide.” It does this by collecting donated computers and peripherals, refurbishing them, and awarding them to nominated students who don’t already have a computer at home. Here’s a great, quick video with more information about the organization. Triage - Computers are inspected, insides are thoroughly cleaned, parts such as hard drives, memory, or DVD drives are added or replaced, and BIOS settings are updated or verified. 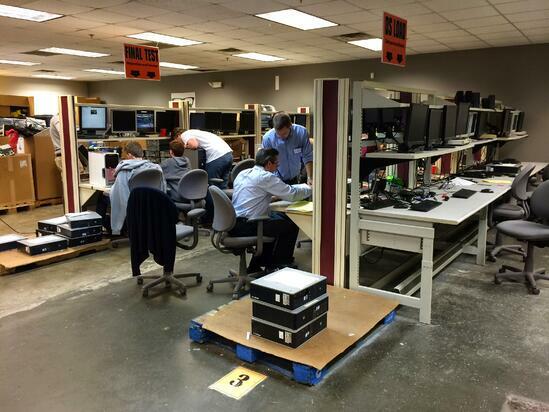 Cleaning - Components such as monitors, CPUs, keyboards, and mice are inspected and cleaned. OS Load - Ubermix, a Linux-based operating system pre-loaded with an assortment of productivity tools and educational games, is loaded. Final Test - Hardware and software is checked one last time to ensure the refurbished computer is ready for use. Along the way, if any components prove to be defective, they’re sorted for recycling. While CloudFactory and Kramden objectives and value propositions are distinct, parallels in how solutions are designed and work is completed are quite striking. Kramden doesn’t ask its volunteers to each refurbish an entire computer from start to finish. Working in this way would be difficult. For example, there are lots of steps involved - one could easily be tripped up just trying to remember the order of everything. And not everyone has the necessary skills to complete all tasks quickly and accurately. Furthermore, the same volunteers don’t show up every week; it’s easier to train new workers if they can focus on a smaller set of tasks. So the process is broken into multiple stations in a workflow, with different volunteers assigned to different stations. After initial training is provided, volunteers focus on specific tasks, referring as needed to detailed sets of instructions and receiving motivation and support from Kramden staff or fellow volunteers. In this model, volunteers can become productive very quickly. That evening was the first time I had worked at the “Triage” station - I started off slowly, but improved my speed by almost a third after each of my first two computers. Kramden has organized its process into smaller, logical pieces to help its volunteers complete accurate, high-quality tasks that result in a refurbished computer for deserving students. At CloudFactory, a similar model is at play each day as we design and operate “virtual production lines” to process massive volumes of our clients’ unstructured data. Thanks to the good folks at Kramden for having us. We’ll be back!